APPLY NOW!!!!! APPLY NOW!!!!! 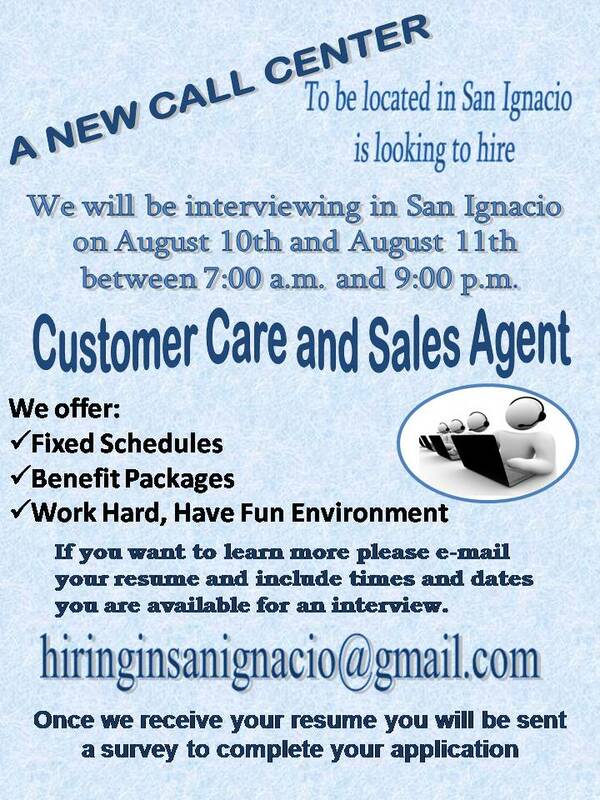 APPLY NOW!!!!! The World Bank has released a new tool for services companies, academics, government officials, and trade associations. It provides data on services trade policies across 103 countries (24 developed and 79 developing), 18 services sectors from within 5 broad industries (financial, telecommunications, retailing, transportation and professional services) and 3 modes of delivery (cross-border, commercial presence, presence of natural persons). The Database is now publicly available below. Belize has once again identified another gateway to attracting more visitors, and investors to our country, which is, through the emergence of Medical Tourism. 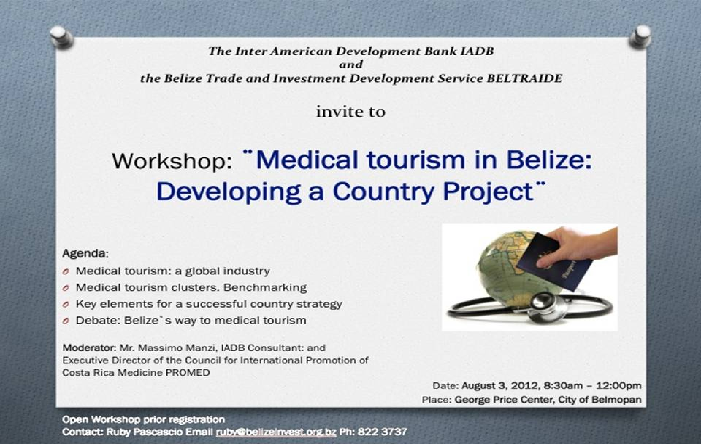 With this being said, the Inter-American Development Bank (IADB) and the Belize Trade and Investment Development Service (BELTRAIDE), will be having the first ever workshop on Medical Tourism in Belize; with the purpose of developing a country profile. This workshop will be held on August 3, 2012, from 8:30 a.m.- 12:00 p.m., at the George Price Center, in the City of Belmopan. Mr. Massimo Manzi, the IADB Consultant, and the Executive Director of the Council for International Promotion of Costa Rica Medicine (PROMED) will be the moderator at this workshop. Topics to be discussed include, the global industry of medical tourism; key elements for a successful country strategy; and Belize’s way to medical tourism. If you are interested to be a part of such initiative, please feel free to contact Ms. Ruby Pascascio, Projects Officer at ruby@belizeinvest.org.bz, or Ms. Florence Cayetano, Public Relations Officer, at florence@belizeinvest.org.bz for further information. Caribbean Export Development Agency (Caribbean Export) will be facilitating participation for 15 CARIFORUM companies in the agroindustry sector to attend Expo Cibao 2012 in the Dominican Republic. This expo will be held from September 10-16, 2012. Suitable applicants are invited to submit an Expression of Interest to participate in the show (Exhibition, Forum and B2B meetings). This submission must be made to Romily Thevenin, Research and Communication Officer at rthevenin@carib-export.com by August 3, 2012 by 4:30 PM. For further information on the show and application details please feel free to contact Romily Thevenin, Communication & Research Officer, Caribbean Export, or access the web site www.carib-export.com. 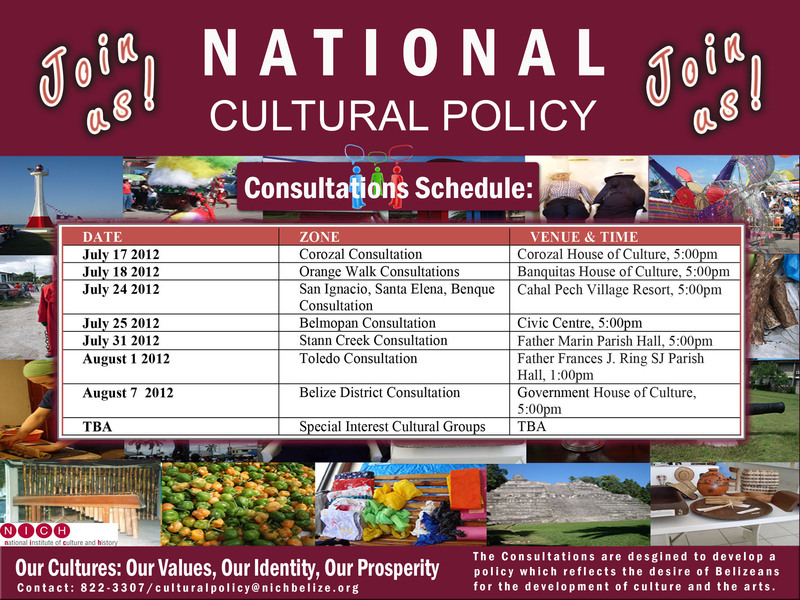 The National Institute of Culture and History hereby informs the general public that countrywide consultations will be carried out during July and August 2012 to develop a National Cultural Policy. The consultations are designed to identify the linkages between culture and development and to discuss economic, social, and cultural factors which should be considered in the decision- making process at the national level. The end goal is to develop a better understanding of Belizean culture; encourage social participation; develop positive cultural attitudes; and introduce a policy which reflects the desire of Belizeans for the development of culture and arts.